Our mission at LOTUS Stress Relief is to help people heal physically, emotionally, and spiritually by reducing the stress in their lives. LOTUS Stress Relief was founded on the premise that we are all coping with multiple stresses in our complex modern world: health concerns, financial worries, work pressures, job loss or downsizing, family worries, relationship problems, environmental toxins, emotional stress, or fear of the future. Doctors confirm that over 82% of their office visits are due to stress-related issues. As we all know, continual stress can lead to very serious health issues. 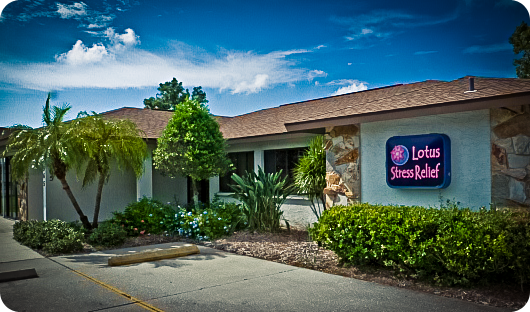 Our caring LOTUS Stress Relief staff is committed to helping you relieve the stress in your life. Our therapy is quiet, non-invasive, reassuring and deeply helpful to your tired body and mind. LOTUS Stress Relief Center uses a combination of biofeedback, neurotherapy and neurofeedback for stress reduction and stress management. We help you manage your stress with these relaxing therapies and through our stress relief coaching. These sessions can be in person or on the telephone. You can visit our office in Sarasota, Florida for a session or to learn about setting up your own biofeedback center. The LOTUS Stress Relief Programs can also help you with an increased sense of well being, mental clarity, concentration, and quality of sleep. The lotus water flower symbolizes birth and rebirth with petals that open at sunrise and close at sunset. It is grounded in the mud (earth) with a long stem that symbolizes our connection to our origins while the open blossom represents the hope of enlightenment (sky).